The best things in life are sweet, so skip straight to dessert with this sprinkles-themed stemless wine glass. 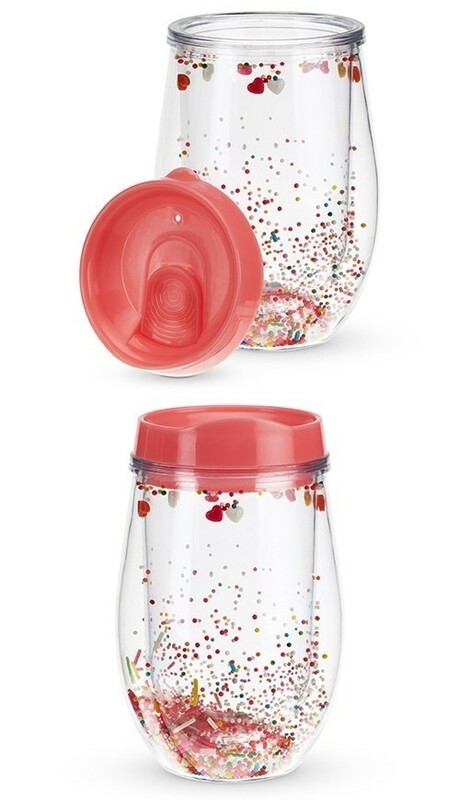 Perfect for on-the-go beverages and picnics galore, these trendy tumblers are candy-coated and built for fun with floating sprinkles and mini hearts in-between the double-walls of the tumbler. A slide-top lid guarantees spill-free drinking. Holds 10 fluid ounces. "My wedding favor ideas cheap order just arrived and I'm thrilled with these wedding favors. I bought one for myself and one as a wedding shower gift. You have done a superb job! I'm pretty sure it'll be the hit gift of the wedding shower." Kathy G.